OTTAWA - Canadians set aside politics Monday and stood in solidarity with NDP Leader Jack Layton, who announced he's leaving the job temporarily to fight an unexpected new cancer. Layton had previously gone public with his struggle against prostate cancer, but his wan face, thin body and raspy voice at a Toronto news conference announcing his latest diagnosis triggered an emotional torrent of support as the depth of this illness became obvious to all. "My heart breaks for Jack Layton and his family today. Bless his heart for maintaining such high spirits in the face of this terrible illness," said a tweet from a woman identifying herself as Lauren Gilhooly. Her comment, one of thousands on Twitter, was matched on Layton's Facebook page, where hundreds of Canadians rushed to offer comforting words. "My mother has been battling cancer for five years; several days ago, she was told that the cancer has spread. Just like I told her, I'm telling you that you can beat this," said a man signed Brian Jonathan Appel. "Remain positive and keep fighting. All of Canada, regardless of political stripe, is with you during this difficult time in your life!" The rallying Monday afternoon was reminiscent of the reaction in 1994 to Lucien Bouchard's struggle with necrotizing fasciitis. The separatist Quebec leader, who lost a leg to the flesh-eating disease, won the sympathy of all Canadians, regardless of political position. 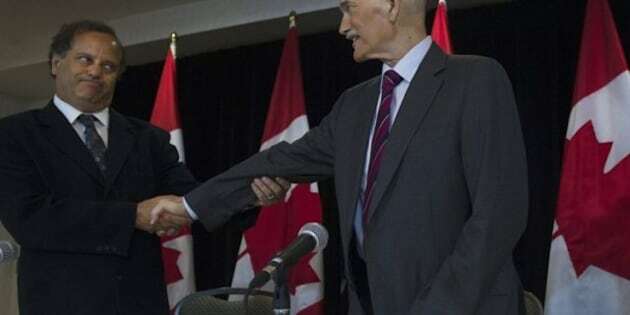 Prime Minister Stephen Harper, who sparred tartly with Layton in the recent election campaign, said he was "deeply saddened today to hear that Jack Layton is temporarily leaving his post as leader of Her Majesty's Official Opposition and leader of the New Democratic Party . . ."
"I salute the courage Mr. Layton continues to show in his fight against cancer, a fight that more and more Canadians are winning. We are all heartened by Jack's strength and tireless determination, which with Mr. Layton will never be in short supply." Another natural political foe, Toronto Mayor Rob Ford, was also fully supportive in a tweet: "Jack, wishing you and your family all the best -- you have always been a fighter." Said Elizabeth May, Green party leader: "Our thoughts and prayers are also with (wife) Olivia Chow and all of Jack's family as well in this difficult time." And from Liberal Leader Bob Rae, whose party was deposed as official Opposition by Layton's electioneering: "We know that Jack is an incredibly resilient man who does not give up a fight. During the last election, he showed an incredible courage in the face of health challenges." Pat Wallis on Facebook seemed to sum up the feelings of all Canadians: "Your strength is an inspiration. The whole country, regardless of political persuasion, has got your back! See you in September, Jack." "Your support and well wishes are so appreciated. Thank you. I will fight this -- and beat it."